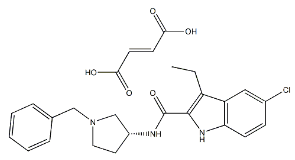 HU-308 is a potent, selective agonist for the peripheral CB2 receptor. The Ki for CB1 is >10 µM, while the Ki for CB2 is approximately 20 nM. JWH 412 demonstrates Ki values of 7.2 and 3.2 nM at CB1 and peripheral CB2 receptors, respectively. MN-18 is a synthetic cannabinoid modeled after AKB48, with the adamantyl group replaced by a naphthalenyl group. EAM-2201 (4'-ethyl-AM-2201, 5"-fluoro-JWH-210) is a drug that presumably acts as a potent agonist for the cannabinoid receptors. (±)-SLV319 is the racemate of SLV319. 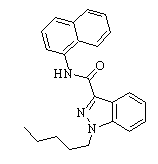 SLV319 is a potent and selective cannabinoid-1 (CB-1) receptor antagonist with an IC50 of 22 nM. Org-29647 is an allosteric modulator of the CB1 receptor. Org27759 is an allosteric modulator of the CB1 receptor. AM251 is a cannabinoid receptor antagonist. MAM-2201 is a hybrid of two known cannabinoid compounds JWH-122 and AM-2201, both of which had previously been used as active ingredients in synthetic cannabis blends before being banned in many countries. LY2828360 is a novel potent, selective, and efficacious CB2 agonist.